Samoan Archipelago. 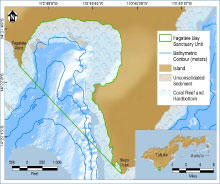 Click here for a larger map. The sanctuary is located in both territorial and federal waters of the U.S. territory of American Samoa. American Samoa constitutes the eastern portion of the Samoan archipelago, a 301 mile (485 km) long volcanic island chain in the South Pacific Ocean region of Polynesia. American Samoa is about two-thirds of the way between Hawaii and New Zealand. American Samoa is the only U.S. territory south of the equator and is composed of seven land masses, including five volcanic islands, and two coral atolls. From west to east American Samoa’s islands are Tutuila, Aunu’u, Ofu, Olosega and Ta’u (the latter three are collectively known as the Manu’a Islands). Rose Atoll is about 100 miles (160 km) east of Olosega, and Swains Island is about 200 miles (320 km) northwest of Tutuila. 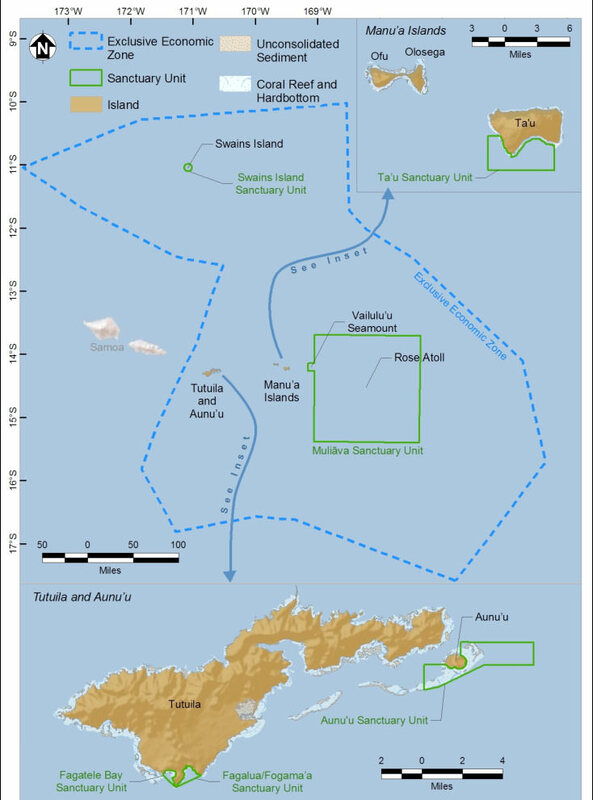 The sanctuary includes areas at Tutuila, Aunu’u, Ta’u, Rose Atoll and Swains Island. See below for maps and descriptions. Fagatele Bay Click here for a larger map. 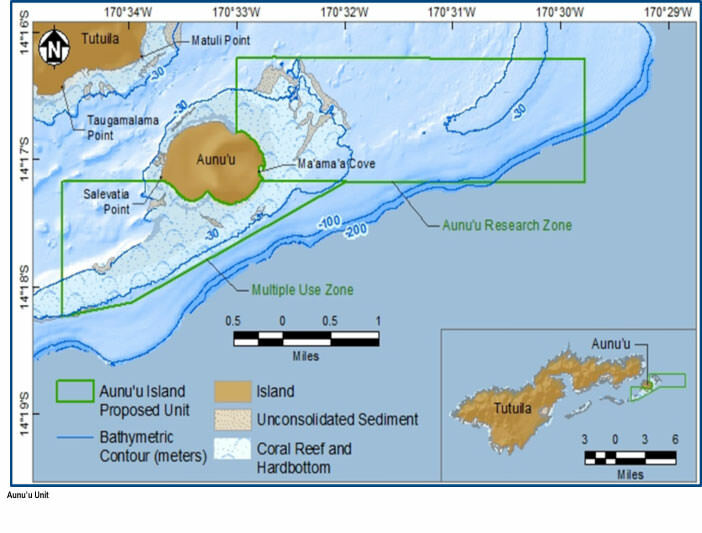 Fagatele Bay is a 0.25 square mile (0.65 square km) coastal embayment that extends from Fagatele Point to Steps Point along the southwestern coast of Tutuila Island. This naturally protected bay was formed by a collapsed volcanic crater and is surrounded by steep, forested cliffs. Fagalua/Fogama’a Click here for a larger map. 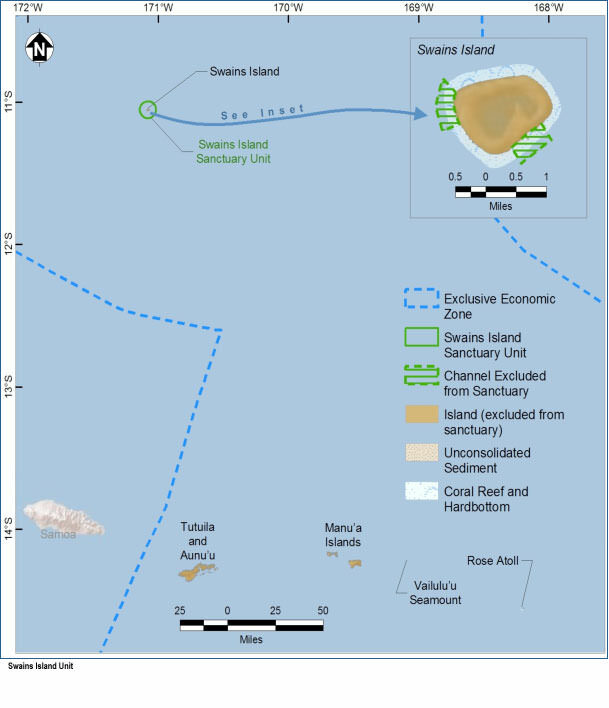 Fagalua/Fogoma'a is just east of Fagatele Bay on Tutuila Island and is slightly larger at 0.46 square miles (1.2 square km). Fagalua and Fogama’a coves make up the inner, western portion of the entire bay area, which extends from Steps Point to Sail Point Rock. Like Fagatele Bay, Fagalua/Fogama’a was formed by a flooded volcanic crater and is surrounded by steep, forested cliffs. Aunu’u Island Click here for a larger map. Aunu’u is a small, volcanic island approximately 2 km southeast of Tutuila with a land area of 1.5 square km. 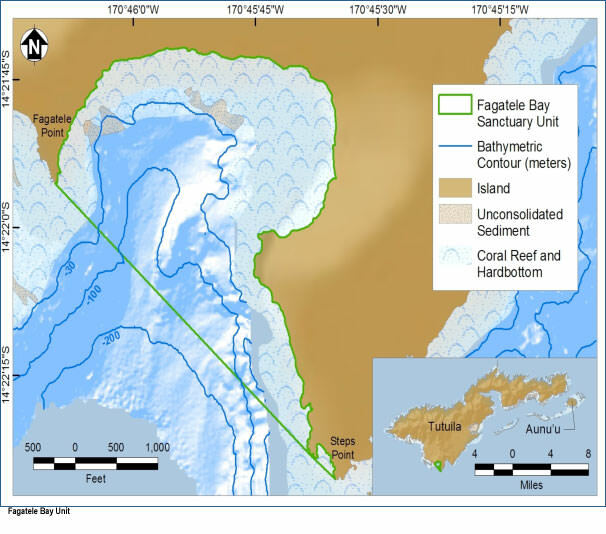 This sanctuary area encompasses 5.8 square miles (15 square km), borders the island on three sides, and includes boundaries established based on identifiable landmarks (e.g., Taugamalama Point, Salevatia Point) to assist boat-based users in identifying whether they are within or outside sanctuary boundaries. Ta’u Island Click here for a larger map. Ta’u, part of the Manu’a Island group, is a volcanic island located approximately 150 km northeast of Tutuila Island that is ringed by extremely steep sea cliffs and a steeply dropping seafloor. 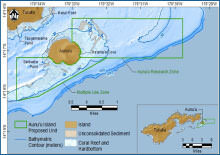 Ta’u has a south-facing embayment, the result of collapse and landslides off the remnants of a southern caldera similar to the Fagatele Bay formation. 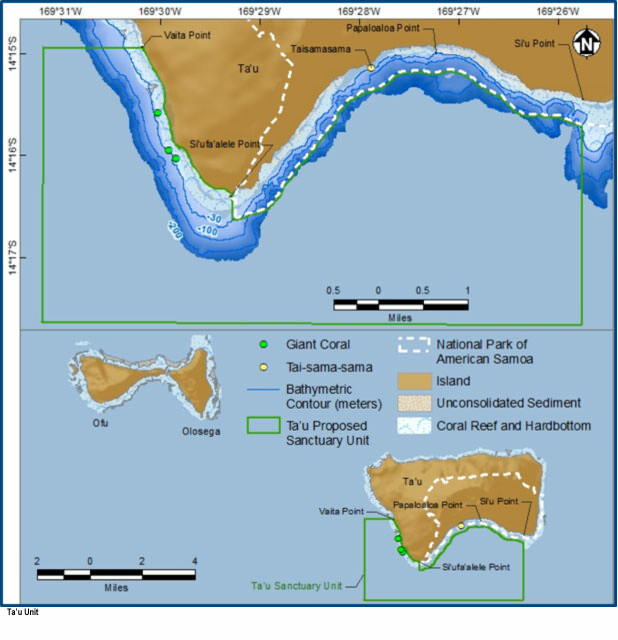 The Ta’u Island sanctuary area encompasses 14.6 square miles (37.8 square km) and includes waters from Vaita Point to Si’ufa’alele Point along the western coast, and from Si’ufa’alele Point to Si’u Point along the southern coast. 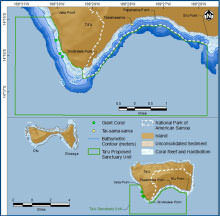 The inner sanctuary boundary along the southern coast is adjacent to, but does not include the nearshore waters of the National Park of American Samoa, which extend 0.25 nautical miles from shore. 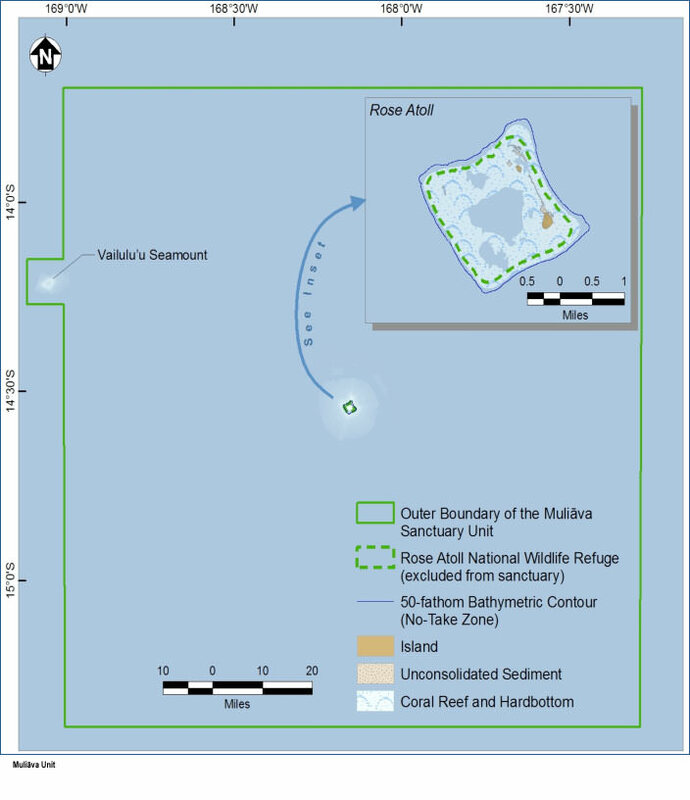 Muliāva (Rose Atoll and Vailulu’u Seamount) Click here for a larger map. Rose Atoll is approximately 150 miles (240 km) east-southeast of Tutuila Island’s Pago Pago Harbor. It is the easternmost Samoan island, the southernmost point of the United States, the only atoll in the Samoan archipelago and one of the smallest atolls in the world. 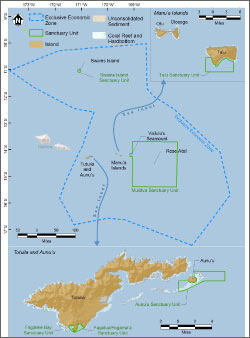 The Muliāva sanctuary area encompasses 13,507.8 square miles (34,985.04 square km) of marine waters of the Rose Atoll Marine National Monument and waters surrounding the Vailulu’u Seamount, the only hydrothermally active seamount within the EEZ. 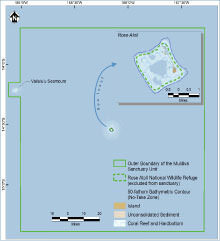 The inner sanctuary boundary is adjacent to the seaward boundary of the Rose Atoll National Wildlife Refuge. 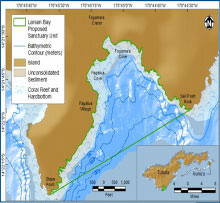 Hence, the sanctuary does not include the land or lagoon waters that make up the refuge. Swains Island Click here for a larger map. 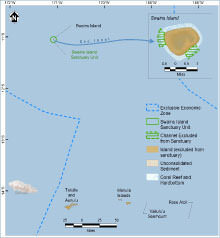 Swains Island is a low-lying emergent seamount and coral atoll located about 200 miles (350 km) northwest of Tutuila. It is geologically part of the Tokelau volcanic island group and not the Samoan volcanic chain. 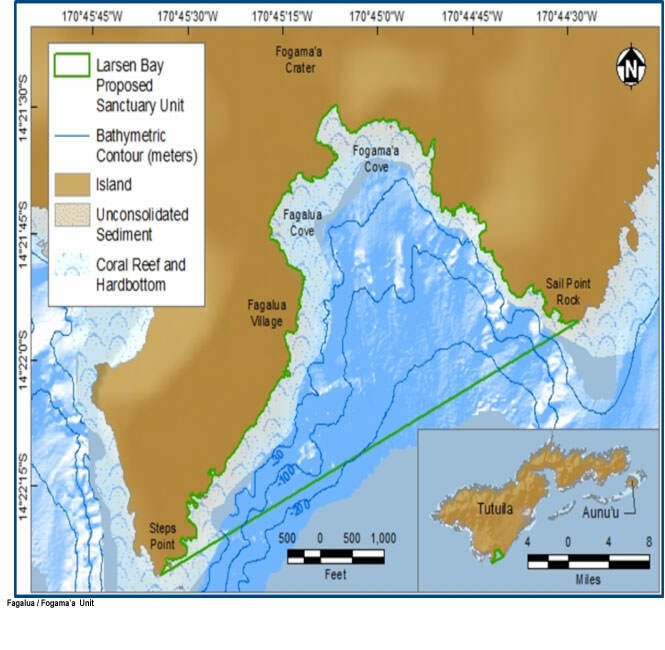 This sanctuary area encompasses 52.3 square miles (135.5 square km) and includes territorial waters within a 3 nm circle of the island, excluding the interior lagoon and two channels between the lagoon and the sea.